Do you know what PeakOptical has to offer to you and your business? We carry over 10 years of experience in the field of fibre optic components and during our years of activity we have assisted (and continue collaborating with) customers worldwide. We put a great accent on flexibility. We design our products in a way they work in the majority of the network environments simply because we want to offer our clients the freedom of setting up their network in the way it suits their company the best. Our solutions open countless oportunities to scale any broadband environment. Our products are known for their extensive reach, stability and consistency. Our portfolio covers a complete product matrix, which is fully compatible with the leading OEMs in the market and is manufactured in accordance with the ISO 9001:200 and the latest WEEE directives. 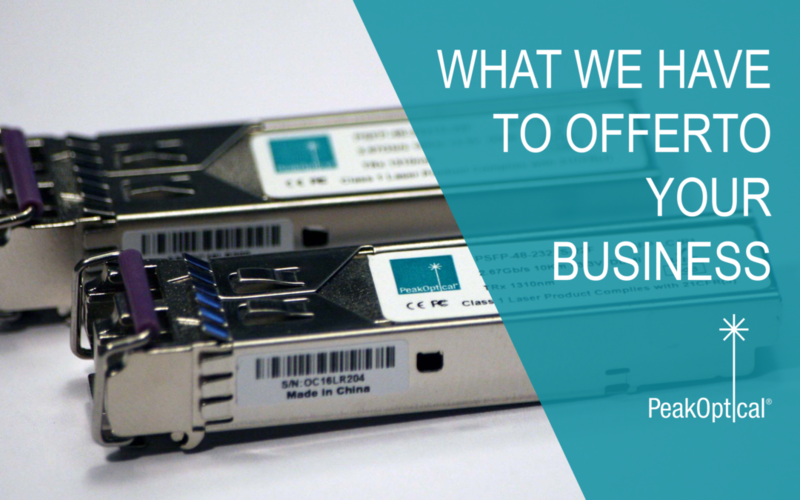 PeakOptical’s transceivers are fully compatible with the vast majority of OEM switches, routers, and other networking hardware. Our solutions are customized for extensive reach, stability and uniformity, or any other demands our customers might have. Our list of transceivers covers: CFP, QSFP, SFP28, SFP+, SFP, X2, XFP, XENPACK, GBIC, and optical adapters. Manufacturing both indoor and outdoor fiber optic patch cords, we have high availability in all commonly used terminations and lengths. Besides the Multimode (OM1, OM2, OM3, OM4, and OM5) and the Single Mode cables, we provide a wide range of spare connectors, adapters, pigtails, and attenuators. PeakOptical’s product portfolio covers a line of Ethernet media converters, which transforms your fiber network to 10/100MB/s or gigabit Ethernet. The rages we cover are from 500 meters to 100 km. Our list of media convertors include: Fiber-Fiber Media Converters (fiber conversion and extension), BI-DI Fiber Media Converters (Ethernet to single fiber), Auto-sensing Ethernet Media Converters (fiber to RJ-45), and Video Optical Media Converters (HDMI & SDI to fiber). In an environment where the number of fibers might create limitations, our CWDM AND DWDM solutions open countless opportunities to scale broadband. With today’s DWDM technology, it’s possible to achieve 400Gb/s over a single fiber, and with 40Gb/s and 100Gb/s transceiver technology, clients are able to get a significant amount of capacity out of their existing connections. Because we want to make sure your fiber optic infrastructures is complete and well-taken care of, PeakOptical provides a wide selection of accessories. We cover test and measurement devices – for an accurate inspection and fiber tracing, cleaners – for a flowless functionality, tool kits – for installation and maintenance, protection accessories – for durable protection of fiber optic components, and spare parts. Lifetime warranty is defined as the end-of-life (EOL) date + additional 5 years.